South Africa uses a range of national symbols to identify the country which includes: National flag, National Anthem, National Bird, National Animal, National Fish, National Flower, Coat of Arms and National Orders. According to Wikipedia, a national symbol is a symbol of any entity considering itself and manifesting itself to the world as a national community: the sovereign states but also nations and countries in a state of colonial or other dependence, (con)federal integration, or even an ethnocultural community considered a ‘nationality’ despite having no political autonomy. Through this post, we will be taking a look at the South African National Symbols one by one. The flag of South Africa was designed by the then State Herald of South Africa Frederick Brownell in March 1994 and was adopted on 27 April 1994, at the beginning of South Africa’s 1994 general election. 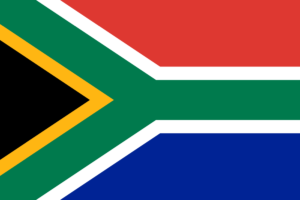 The South African flag has six colours: Green, Black, White, Gold, Blue, and Red. Green represents natural wealth, while white represents peace. The design and colours of the South African flag are a synopsis of principal elements of the country’s flag history. The colours actually do not have any essential meaning. Black, Green and Gold yellow is found in the flag of the African National Congress. Red, White, and Blue are used in the modern flag of the Netherlands and the flag of the United Kingdom; the colours white and blue were also found in the old flag of South Africa. The national anthem of South Africa which was adopted in 1997 combines extracts from the Xhosa hymn Nkosi Sikelel’ iAfrika (“God Bless Africa”) with extracts from the former national anthem Die Stem van Suid Africa (“The Voice of South Africa”). The first verse is in isiXhosa and isiZulu, the second verse is in Sesotho, the third verse is in Afrikaans while the last and final verse is in English. The National Coat of Arms is the highest visual symbol of the state. It is elegant and contemporary in design and distinctly egg-shaped. The central image of a secretary bird with uplifted wings, The sun rising above the horizon is placed between the wings of the secretary bird and completes the oval shape of ascendance. Ears of wheat: This signifies the emblems of the fertility of the land. Tusks of the African elephant: This symbolizes wisdom, strength, and steadfastness. The motto of the National Coat of Arms in a green curve is !ke e:/xarra//ke, which means “diverse people unite”. South Africa’s current national orders were issued for the first time in 2002. Anyone is eligible for nomination, and nominees don’t have to be famous but must have performed an act of bravery or rendered exceptional service to the country. Order of Mapungubwe: this is awarded to South African citizens for excellence and exceptional achievement. Order of the Baobab: it is awarded for distinguished service in business and the economy; science, medicine, technological innovation; and community service. Order of the Companions of OR Tambo: it is awarded to heads of state and other dignitaries promoting peace, cooperation, and friendship towards South Africa. It is awarded in three categories to eminent foreign nationals and other foreign dignitaries for friendship shown to South Africa. Order of Luthuli: this is awarded to South Africans who have made a meaningful contribution to the struggle for democracy, human rights, nation-building, justice and peace, and conflict resolution. Order of Ikhamanga: this is awarded to South African citizens for excellence in arts, culture, literature, music, journalism or sports. This award is made in made in three categories. The exceptional achievement Order is awarded in gold, for excellent achievement, it is awarded in silver while it is awarded in bronze for outstanding achievement. Order of the Mendi Decoration for Bravery: this is awarded to South African citizens who have performed extraordinary acts of bravery. The act of bravery could have been performed in or outside the Republic of South Africa. The National Animal of South Africa is the Springbok. The scientific name of this animal is Antidorcas marsupialis. The South African national rugby team name fondly known as “the Boks” or “die Bokke” was derived from the name of this animal. The springbok is South Africa’s most popular antelope. This mammal is a vegetarian which can grow up to 75 cm in height. The national bird of South Africa is the Blue Crane. The scientific name of this animal is Anthropoides paradisia. They are common in the Karoo and can also find them in the grasslands of KwaZulu-Natal and the highveld, usually in pairs or small family parties. They feed on seeds, insects, and reptiles. The Blue crane distribution is almost entirely restricted to South Africa. The national flower of South Africa is the King Protea. The scientific name of this flower is Protea cynaroides. The flower can be found in the south-western and southern areas of the Western Cape, from the Cedarberg up to just east of Grahamstown. The Proteas is the name given to the South African national cricket team. The National Fish of South Africa is the Galjoen. The scientific name of this fish is Dichistius capensis. It is found along the coast from Namibia to Durban, and nowhere else in the world. The fish feeds majorly on red bait (ascidians), small mussels and barnacles. The national tree of South Africa is the Real Yellowwood Tree. The scientific name of this tree is Podocarpus latifolius. It is found from Table Mountain along the southern and eastern Cape coast, the Drakensberg up to the Soutpansberg and the Blouberg in Limpopo. This tree can grow up to 40 metres in height with the base of the trunk sometimes up to 3 metres in diameter.